Union County, NJ – Okay all you Passport Stamp enthusiasts out there, get ready to go crazy. Union County is going into its second year with the Passport To Your National Parks program. 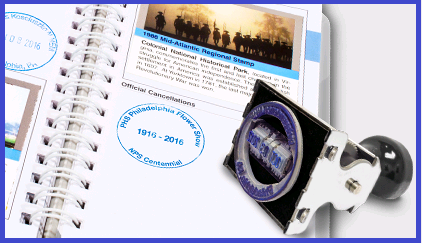 For the upcoming Four Centuries In A Weekend event on October 20 and 21, a whole new set of “Union County Across The Centuries” stamps will be introduced at every site. Union County unveiled its first set of national parks stamps last year, to recognize Revolutionary War era sites in the county that are part of the National Park Service Crossroads of the American Revolution National Heritage Area. Parks enthusiasts travel all around the country just to have their passports stamped. While many Union County historic sites date back to the 1700s, a number of them were built later and represent other significant chapters in county history. “We wanted to find a way to bring those sites into the excitement. People love to collect these stamps,” Granados said. A free new Union County passport was also printed for the upcoming Four Centuries event, where sites are open from Noon to 5:00 p.m. on Saturday and Sunday, October 20 and 21. The “Passport to Your National Parks” stamps, which were unveiled at last year’s Four Centuries in a Weekend event, effectively tripled the number of national parks passport stamp locations in New Jersey overnight. Passport stamp collectors bring their Passport books to national parks, monuments and other areas overseen by the National Park Service. They can now collect more than 20 new stamps at Union County sites. Union County is one of 14 New Jersey counties that comprise the Crossroads of the Revolution National Heritage area, which recognizes the role New Jersey played in the American Revolution. Because the Union County area was one of the earliest regions to be settled, there are numerous sites of significance from the Revolutionary War era. These sites now have their own unique passport stamp recognizing their inclusion in the National Heritage Area. “It is a great feeling to be able to help our local historical societies promote their sites,” said Union County Vice Chairman Bette Jane Kowalski. “We know that there are people who travel to sites, in part, to add another stamp to their Passport book,” Kowalski said. Several sites will have multiple stamps because of their location. For example, the Miller-Cory House in Westfield is a historic site in its own right and is also along the Washington-Rochambeau National Historic Trail, which recognizes the contribution of the French in winning the Revolutionary War. Several battles in Union County were also memorialized with the stamps. In Berkeley Heights, the Deserted Village of Feltville/Glenside Park and the Littell-Lord Farmstead. In Clark, at the Dr. William Robinson Plantation-Museum. In Elizabeth, at Boxwood Hall, First Presbyterian Church of Elizabeth, Snyder Academy. Nathaniel Bonnell Homestead & Belcher-Ogden Mansion, and St. John’s Parsonage. In Hillside, at Woodruff House-Eaton Store Museum. In Mountainside, at the Deacon Andrew Hetfield House. In New Providence, at the Salt Box Museum. In Plainfield, at the Drake House Museum and Plainfield Meeting House. In Rahway, at Merchants & Drovers Tavern. There will also be a stamp recognizing the King’s Highway. In Roselle, at the Abraham Clark Memorial House. In Scotch Plains, at Elizabeth and Gershom Frazee House and Osborn Cannonball House. And at Ashbrook Reservation, on Raritan Road, to mark the Battle of the Short Hills. In Springfield, at the Cannon Ball House. There will also be a stamp for the Battle of Springfield. In Summit, at the Carter House. In Union, at Liberty Hall, Connecticut Farms Church and Caldwell Parsonage. In Westfield, at the Miller-Cory House Museum, which will also have a stamp recognizing the Washington-Rochambeau National Historic Trail. The Union County Office of Cultural & Heritage Affairs will continue to offer free Union County Across the Centuries passports at all Union County historic sites. Persons interested in purchasing a national passport can visit the official online store of the National Park Service at eparks.com/store/category/30/278/Passport. Launched by Eastern National in 1986, the Passport To Your National Parks program consists of a guidebook highlighting national parks and provides space for dated ink “cancellation” stamps that enable visitors to commemorate their visit. More information on the program is available at: eparks.com/store/category/30/278/Passport-Books. To learn more about the Union County Office of Cultural & Heritage Affairs visit online at ucnj.org/parks-recreation/cultural-heritage-affairs. Addresses for the various historic sites across the county are available online at ucnj.org/atc.